Bulk Rename Utility is a file renaming application for Windows that able to allow users to rename files and entire folders based on defined criteria. 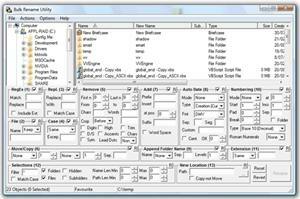 Bulk Rename Utility is a simple and user friendly application. The users may add date/time stamps, replace numbers, insert text, convert case, add auto-numbers, process folders and etc. Bulk Rename Utility ables to rename single files or multiple files quickly, according to user defined criteria. It also allows users to preview the details of the files properties before renaming. In addition, the users can rename photos by using EXIF data like date picture taken, resolution and other information that embedded in all JPG photo files. Beside that, the users also can rename the MP3 files by using ID3 tags. Other features include supports command line, change files creation and modification time stamps. It is a freeware and available for download.